The month of April began with a colder-than-normal air mass in the eastern US and it looks like we’ll have additional cold air outbreaks over the next couple of weeks or so. Teleconnection indices such as the Arctic Oscillation (AO) and North Atlantic Oscillation (NAO) both signal a sharp drop in coming days to negative territory which typically results in the penetration of cold air outbreaks from central Canada into the eastern US. 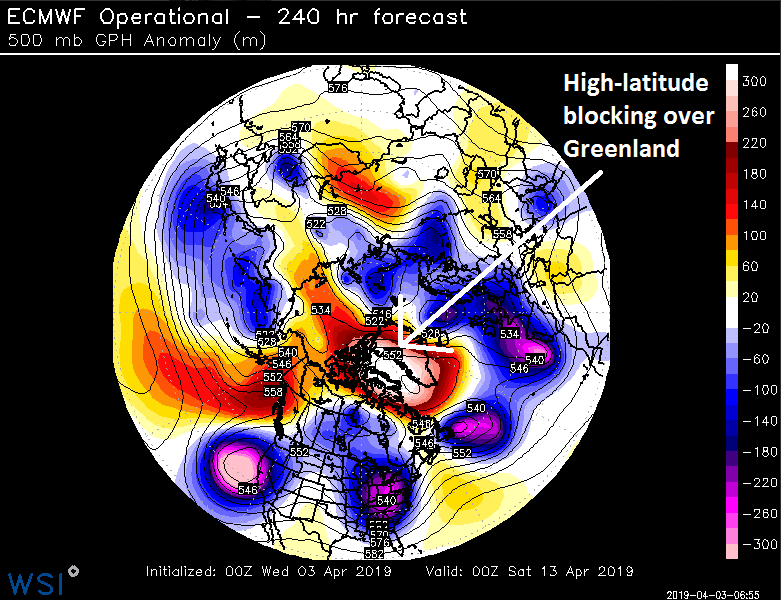 Medium-range forecast maps of 500 mb height anomalies support this notion of additional cold air outbreaks as we progress through the month of April with “high-latitude blocking” in evidence over northern Canada and Greenland. “High-latitude blocking” is likely to set up over northern Canada and Greenland in about ten days or so. Forecast map courtesy ECMWF, WSI, Inc. (twitter Michael Ventrice). Meteorologists track atmospheric pressure and temperatures patterns around the world through numerous index values including the Arctic Oscillation (AO) and its closely-related cousin known as the North Atlantic Oscillation (NAO). These two teleconnection indices can provide useful information regarding upcoming temperature patterns based on their current and forecasted phase (positive or negative) and the given time of year. For example, prospects for future cold air outbreaks into the eastern US can be assessed through the trends in indices such as the AO and NAO during the latter stages of the winter and even into the early part of the spring season. The Arctic Oscillation refers to opposing atmospheric pressure patterns in middle and high latitudes. When the AO is positive, for example, surface pressure is low in the polar region and this helps the mid-latitude jet stream to blow strongly and consistently from west-to-east keeping Arctic air locked up in the polar region. When the AO index is negative, there tends to be high pressure in the polar regions (i.e., high-latitude blocking), weaker zonal winds, and greater movement of polar air into the middle latitudes. The AO and NAO index plots show past levels (black) and forecasted levels (red) for the foreseeable future. Indeed, both of these indices are likely to drop into negative territory in coming days which typically results in the penetration of cold air outbreaks into the eastern US from central Canada. The prospects of the AO and NAO indices to drop into negative territory are usually correlated with “high-latitude blocking” which refers to an atmospheric pattern in which higher heights (and pressure) compared to normal sets up in high latitude regions such as Greenland or northern Canada. This type of pattern can remain in place for an extended period of time leading to a large-scale obstruction of surface weather systems. During the latter stages of winter and early parts of spring, this type of setup can result in somewhat persistent colder-than-normal weather pattern for the central and eastern US and perhaps stormy conditions as well. All signs point to a strong high-latitude blocking pattern to develop in about ten days or so virtually ensuring the possibility of more cold shots for the Mid-Atlantic and Northeast US. Stay tuned…April can be the cruelest month.